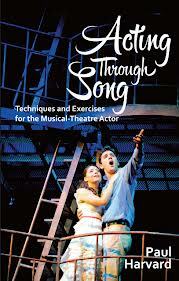 The sub-title to “Acting Through Song” is “Techniques and Exercises for Musical-Theatre Actors”. Paul Harvard addresses the practitioner, but he does it in a style and with a directness and an avoidance of jargon that make it accessible to the enthusiast for musicals. As expected, the editors and designers at Nick Hern have ensured a clear-cut, five-part structure with inset boxes for exercises. A short index would not go amiss; Harvard has much to say of interest on different examples of this most protean of genres. By coincidence the week of my reading of “Acting through Song” has been one where the sheer breadth, and the mixed fortunes, of the musical have been on public view. A jukebox musical has crashed leaving a black hole of five million for the angels to pick up. An old trouper, “the Pajama Game” from 1954, has delighted the critics at Chichester, while Sondheim’s “Merrily We Roll Along” just seems to grow in stature year on year. Paul Harvard does not write from the position of observer. He has been there from the inside. When young he has been witness to the experienced actress in the rehearsal room with a performance so over-blown “it seemed almost grotesque to me.” In the real packed theatre it makes perfect sense. His very first subject is self-consciousness. No-one could write the first part of page four without having been there. He identifies what he terms the three blind alleys. To focus on the singing he calls “hiding behind a good voice.” The cost is in the definition of the acting. “Becoming the Character” and “Playing Emotion” are Harvard’s other prime temptations. No lively theatre author can escape alighting on items of interest to the general reader. Katie Mitchell is here advising her actors to outline what their characters have been up to in the twenty-four hours prior to their arrival on a stage. Musical production teams from America come quite simply from a culture that is different. Harvard advises his actor-singers that their auditions have to be different- “be bolder in your use of space and style and acting”. “Youtube” he writes “is a curse for the modern actor.” On the one hand a performance from the past casts too great a shadow on the present. On the other the internet is a simulacrum of a performance. What you see is not how it was. He is quite right. For the actor preparing, for example, “the Drowsy Chaperone” Summer Strallen doing “Show Off” on Youtube may be irresistibly tempting but is of small advantage. Harvard’s exercises are illuminating for the non-performer. “Walking the Punctuation” sharpens awareness of the precision of vocal timing. He has a nice metaphor of the audience as a dancing partner. Some of his insights are applicable across the arts. “Concentration destroys attention” he writes, acknowledging a debt to Declan Donnellan. This is akin to the painter who steps back over and over to gauge the effect from afar that the strokes of the brush have made close up. Harvard explains that a tilted thyroid cartilage thins the vocal folds in the larynx. The result is a sweeter sound. The example he cites sent me to listen to Mandy Patinkin. I heard “Beautiful” from “Sunday in the Park with George” again, but in a way that was better. When he moves from rehearsal to performance Harvard uses Tevye from “Fiddler on the Roof” as an example. His complex paragraph, knitting together character and God, performer and viewer, evokes the heights that the musical is capable of reaching. “This book is a love letter” Harvard writes “to an art form I have a complex relationship with”. It reads that way. It knows wisely that love is not adoration, that objectivity and critique are not love's antithesis but its completion.